I Hate Fairyland: I Hate Fairyland is Skottie Young completely unleashed and it’s ridiculously entertaining. Prepare for non-stop twisted fun that’s full of gorgeously animated pages. Old Man Logan: The creative team behind my favorite Green Arrow run (Jeff Lemire, Andrea Sorrentino, Marcelo Maiolo) continue to earn my love and support with the character-driven and action-packed return of Mark Millar and Steve McNiven’s future version of Wolverine. They’re the best there is at what they do, and what they do is create a mighty fine Wolverine comic. Also good: All-New Wolverine! Abby is just so lovable and Tom Taylor‘s a gifted writer. Rumble: Hey, you. Yeah, you. 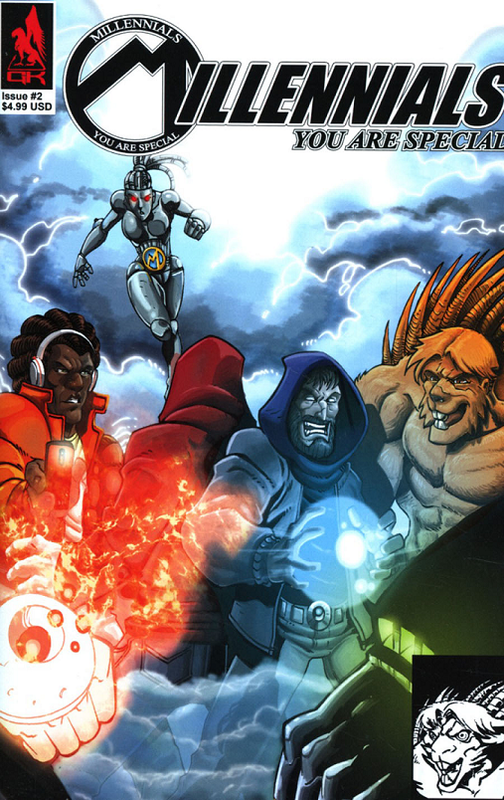 Once you’re done with this article, go check out Rumble from Image Comics. It blows my mind that a book this enjoyable doesn’t get more attention. John Arcudi, James Harren, and Dave Stewart’s comic is impressively creative, constantly exciting, and packing some heart. Please, go give it an honest shot. I’d give you a brief synopsis, but it’s better if you just experience it for yourself. 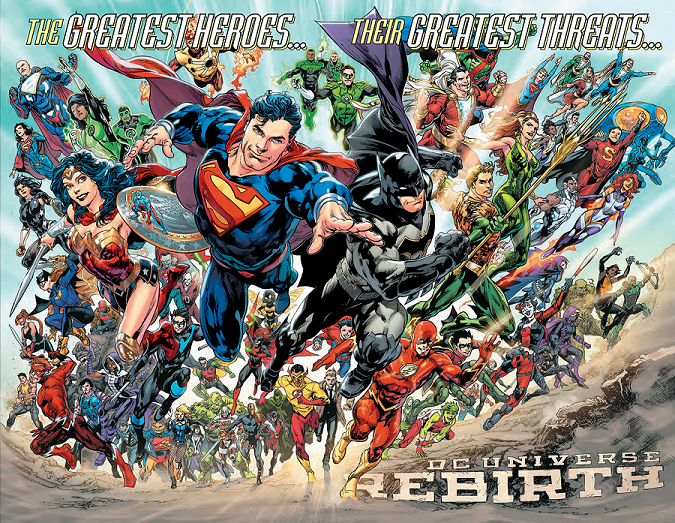 DC Rebirth Superman: The team behind New 52’s Batman & Robin run (Peter J. Tomasi, Patrick Gleason, Mick Gray, John Kalisz) are creating what will no doubt go down in history as one of Superman’s must-read stories. Want a sincerely heartfelt look at the bond between a mother, father, and son? Superman’s there for you. All of the fun superhero action is just a nice bonus. Also a nice bonus: Jorge Jimenez’s art – this guy creates some beautiful pages. Valiant’s cat variants: Valiant continues to publish a solid variety of excellent titles – I can always count on ’em. Sometimes you just want to smile though, and that’s exactly what the cat variants offer. Need a little extra joy in your life? Just take a moment to look at Ninjak cat. Go on, let the cuteness sink in and fill you with happiness. Batman TMNT: I really wish I could go back in time and give this comic to 5 year-old Gregg. (Help me out, Barry?) It’s such a blast and full of fan service. The artwork by Freddie Williams II and Jeremy Colwell gives the story so much extra energy as well. Last but not least, Love is Love going to a third printing is proof that there’s still plenty of good in this world. 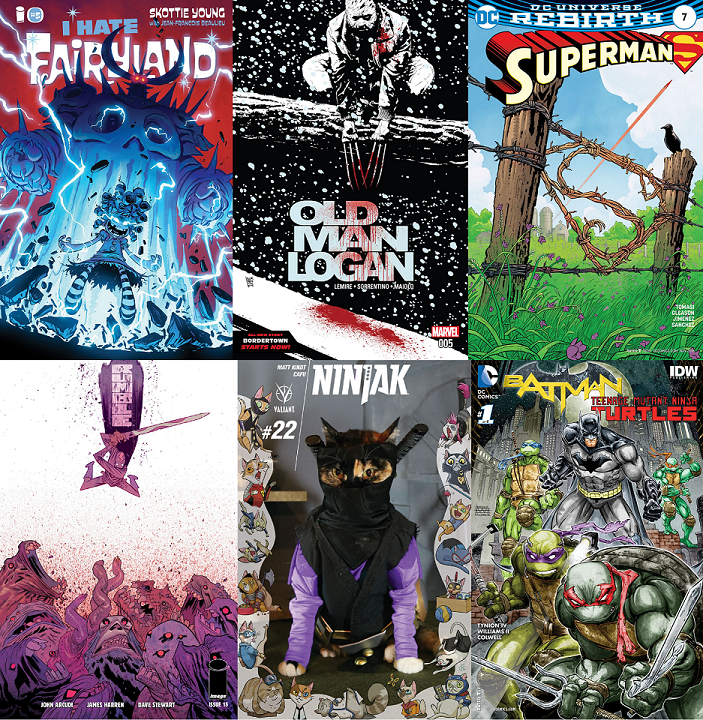 I loved comics this year because there were so many creative visions that were translated into mesmerizing comics. Books like Sam Wilson: Captain America tackled societal issues and made the character one of the most critically important of the modern Marvel landscape. Detective Comics brought together the Batman family in a way I had never seen, with characters like Tim Drake and Kate Kane shining brighter than they have in years. Superman made me feel hope, true genuine hope. An ear to ear smile creeps across my face every time I read it, because it’s the Superman book that we all needed, one with joy and optimism. These books were so special to the world of comics and frankly couldn’t exist anywhere else, and reminded me of how beautiful comics can be. 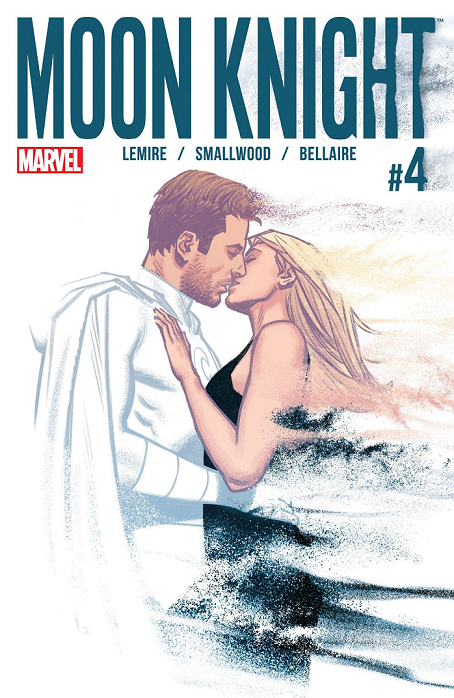 My choice is Moon Knight by Jeff Lemire! And the reason is the different story telling and art styles for each distinct personality makes it feel like you are getting a lot more story than you normally would in any regular comic. Comic books in 2016 have been more reflective of our society than ever before. The allegories have been there for years, but lately have been more in the forefront. These morality tales have delved deeper into the psyche of it’s characters in ways we never thought we’d see. Tom King’s Vision deconstructs human behavior by questioning our views and communication with one another. Jason Aaron’s Doctor Strange explores a technological society that accepts only the world around them and refuses to engage in any mystery of wonder beyond it. Paul Dini’s Dark Night utilizes Batman and Joker to project how our own minds can be our greatest tool or worst enemy given the situations we are put through. These titles, like many others, not only portray the problems around us, but the contributions it takes to fix them. Comic books in 2016 have truly been inspiring. It’s always hard to pick your favorite books of the year. Especially if you work in comic book store and all you do is read comics. Marvel’s best book this year was The Vision by Tom King and Gabriel Hernandez Walta. 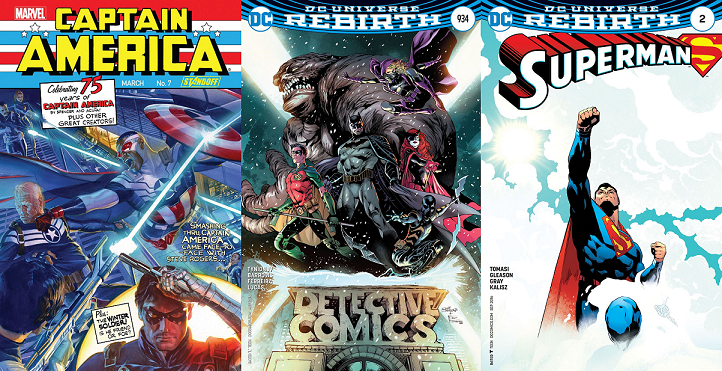 Over by DC they had a Rebirth and you know what I’m loving it. I have to single out Superman by Peter J. Tomasi and Patrick Gleason because I absolutely love that book. Giving Superman a son just make sense on so many levels and it’s been paying off. 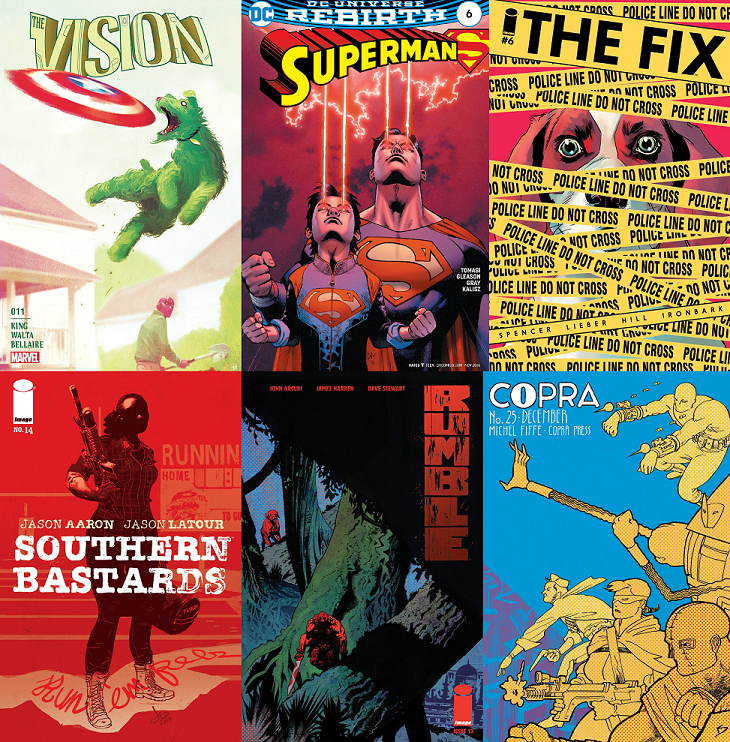 But as always it’s the indie side of comics that surprises me with titles like The Fix, Southern Bastards, and Rumble just to name a few. P.S. if you haven’t already done so check out Copra by Michel Fiffe, trust me you won’t be disappointed. The DC Rebirth event truly re-invigorated my interest in the Flash and Superman characters I’d always been following Batman but the reintroduction of the two title characters I grew up with was truly heartwarming. Earlier this year, I’d finished Grant Morrison’s 1980’s Doom Patrol run, in which the young comic writer rebooted the old silver age title of the same name and completely made it his. Since then, Doom Patrol has seen a few new runs, but none of them had as much hype as Gerard Way and Nick Derington’s Doom Patrol. If you know anything about Way past his involvement as frontman of the successful band My Chemical Romance, you’ll know that the thirty-nine year old pop star is a huge Grant Morrison nerd and had read Morrison’s comics from a very young age, including Doom Patrol. Additionally, Way had previously written two acclaimed volumes of what was essentially an off-brand Doom Patrol titled The Umbrella Academy. Taking both these facts into account, it was no surprise that the world was awaiting Doom Patrol with bated breath, which would be releasing on Way’s new DC Comics imprint called Young Animal. If you took DC’s Vertigo imprint and smooshed everyone into a tight-knit act curated by Gerard Way, you’ll come pretty close to what Young Animal stood for. 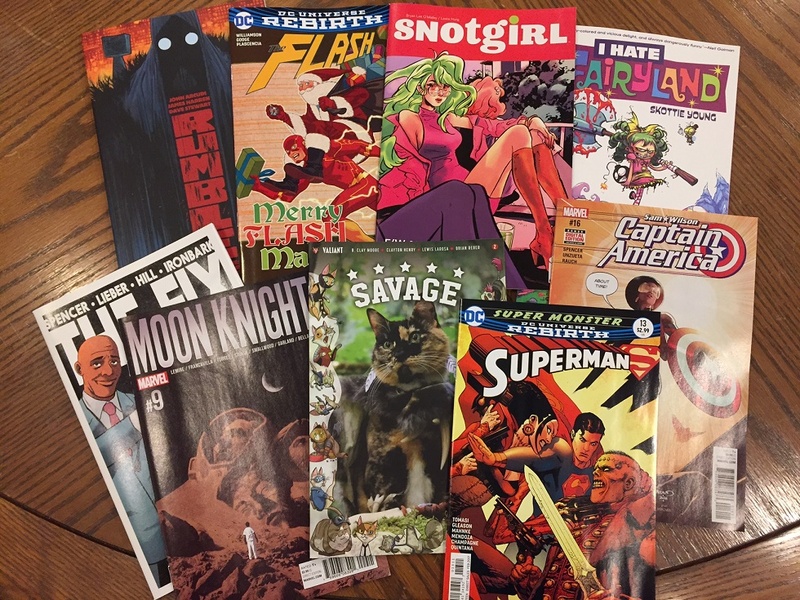 Along with Doom Patrol, Way’s impressive family of comic creators contributed three more ongoing titles to the imprint – Shade The Changing Girl, Mother Panic, and Cave Carson Has A Cybernetic Eye. 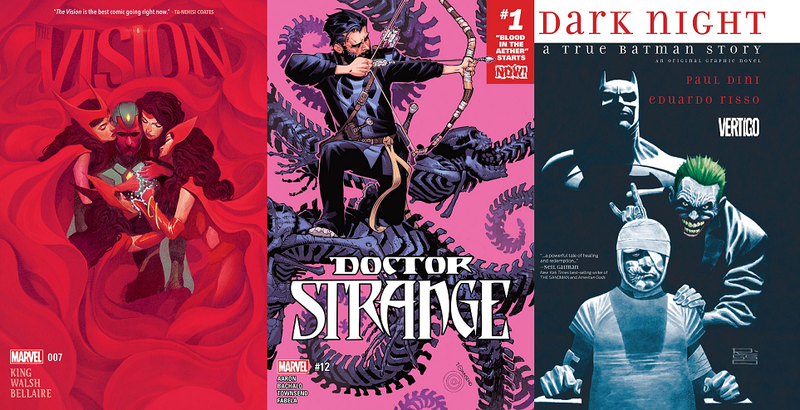 I’d recommend checking out all four of these comics if you’re any bit into the alternative comics scene or have already ate up everything Image Comics offered you this year. If you can manage to get your hands on Paul Rentler‘s superbly designed Young Animal handbook, you’ll get a taste of the entire imprint within this promotional booklet which was distributed some weeks before Doom Patrol’s launch. Speaking of the launch, I stood in line this year at New York Comic Con to obtain a badge to Gerard Way’s very first Doom Patrol signing. I’d arrived two hours early and still faced the disappointment of the DC employee’s empty hands–a definite testament to how anticipated this comic was. Thankfully, I was able to purchase the comic itself (I bought two covers since they really outdid themselves on the variants), and the book lived up to its three-page previews from the internet. For my fellow fans of Morrison’s Doom Patrol, Way’s comic channels the same weird feeling with humor and surprises at every bend, as well as leaving you with many questions after the final page-turn. 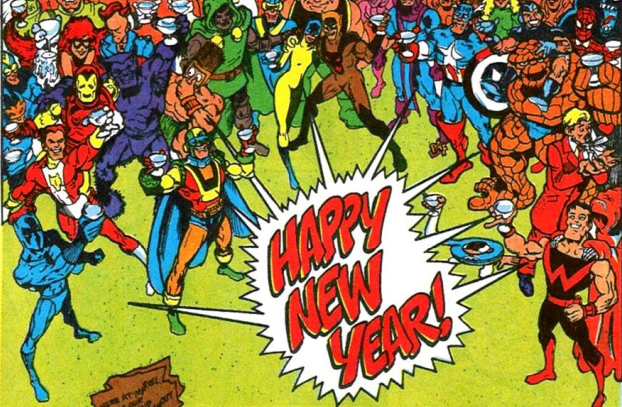 So far, I don’t think any original character was overlooked or has gone unaccounted for. Nick Derington’s art adds a polished-yet-indie feel to the book, dressing it in a unique and memorable look in the same way artist Richard Case did with Morrison’s 1980’s run. For newcomers to the Doom Patrol IP, it’s like a self-aware alternative cape-comic. Very weird and very fun. 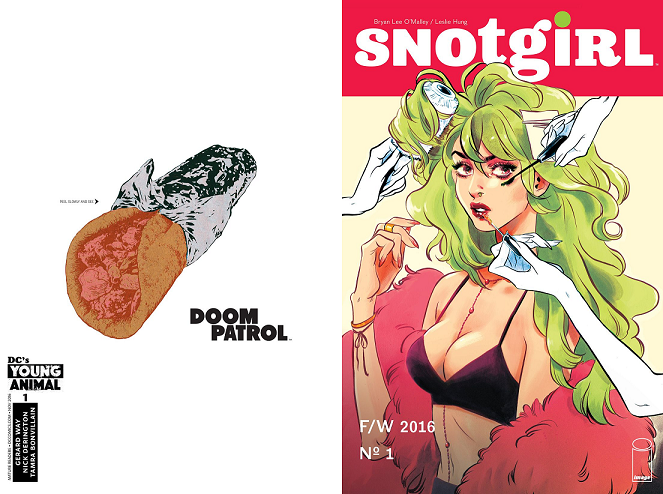 When I wasn’t coding three newsletters at once for Midtown Comics this year or reading DC Young Animal comics, I was probably reading Snotgirl. Published by Image Comics, Bryan Lee O’Malley expertly crafted a slice-of-life mystery revolving around the life of the ravishing Lottie Person, a popular fashion blogger and social media star. The story wove sequential art and social media together without feeling the least bit forced or passé–as expected from the fashion-conscious creator of Scott Pilgrim. I couldn’t think of a more fitting artist for this project than Leslie Hung–her style is cute, comfy, and fun to read, meshing perfectly with O’Malley’s story quirks and characters. I’d recommend this one to anyone looking for a slice-of-life comic with characters in their twenties, or if you’re a Bryan Lee O’Malley veteran who enjoyed the natural dialogue and writing in Scott Pilgrim. Millennials: You Are Special #2 – This witty satire by the same creative team who worked on Millennials: You Are Special #1 has won my heart, with its snappy dialogue and all too accurate social commentary. The villains in this adventure are Coldheart and Apathy. They want to collect money from illicit Magic the Gathering gambling dens and freeze everything in there way. But appearances can be deceiving. Can these villains truly not care about anybody but themselves? Will the Millennials teach them about compassion or are they too self absorbed? Find out by picking up this one of a kind comic.